VIOLENT COP is the explosive and critically acclaimed directorial debut from Japanese master film maker 'Beat' Takeshi Kitano. Kitano is Azuma- a vicious detective who deals out harsh justice with an iron fist- Dirty Harry style. Investigating a drug dealer's murder, Azuma and rookie detective Kikuchi find fellow officers are on the take. When Azuma is caught for beating a gangster he is forced to quit the force. After the gang kidnaps his sister as retribution, Azuma goes on a merciless rampage of revenge. With Kitano's Zen like direction VIOLENT COP is a stylish, smart and skull shattering reinvention of the Japanese Yakuza genre. In short: Violent Cop is a great film. Kitano plays a cold, Dirty Harry style cop well. The film is very well-paced and uses its screen time adequately. 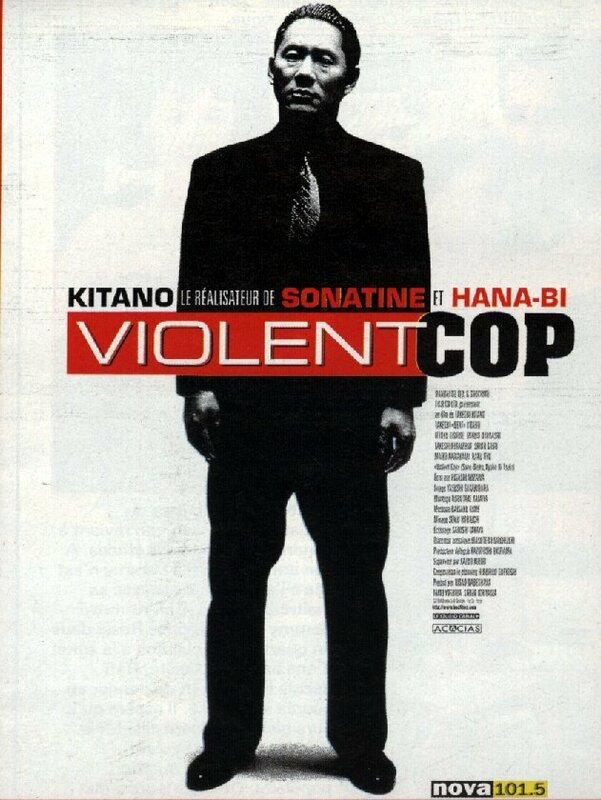 Violent Cop is Kitano’s first film as a director and it does not disappoint. Watch it for an enjoyable hour and forty minutes, and enjoy the climax that will leave you with your mouth wide open while experiencing an ending that you kind of knew would happen. Violent Cop (その男、凶暴につき) is a film about Azuma (Kitano), who is a cold detective that doesn’t care how he treats others. There is no basic plot, just one scene after another of violence, Kitano style. Normally I wouldn’t give praise to a film like this, but it is so well-done that it deserves it. Camerawork is superb, acting is equally good, and the music, though minimal, comes in at just the right times. Kitano, who had this film handed over to him after Fukasaku Kinji left it, establishes himself as a top-notch director with Violent Cop. There are many familiar faces that will appear in later Kitano films, such as Terajima Susumu. Azuma slaps a guy in a bathroom repeatedly 23 times. He beats up a kid. He stops a knife with his hand and chases a criminal for a lengthy period of time, eventually running him over with a car. He also takes care of his mentally deficient sister and visits an art gallery. He shows no emotion, except anger when he interrogates a guy that slept with his sister. Azuma is an interesting character that is played brilliantly by Kitano. Watch Violent Cop to discover Kitano’s roots and to enjoy a good dirty cop/yakuza-style film. Recommended.